Helping agencies plan, develop, test and launch anytime, anywhere, any device mobile products and services for the public. 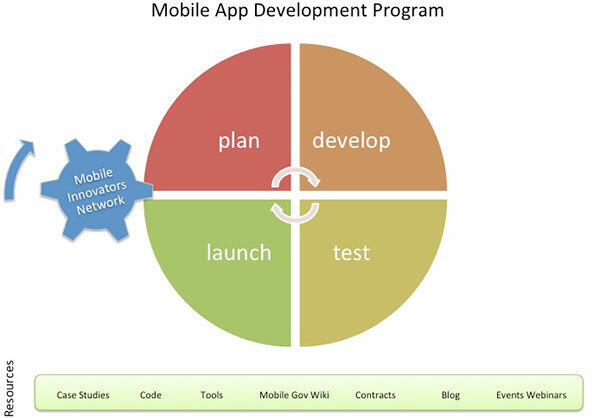 Plan—Build a mobile strategy, see what other agencies have done, use new acquisitions tools to find top mobile developers. Develop—Create great mobile apps and sites using mobile user experience guidelines. Jump start development by leveraging pre-existing code. Test—Make sure your app works on all devices by leveraging automated and in the wild testing support. Test for security & accessibility. Launch—Let people know yours is an official government app by registering it. Get your app in the app stores and leverage API’s for promoting your apps. See what other agencies are doing in the mobile space on the Federal Mobile Apps Directory. Learn how agencies created these mobile products with our more than 25 Mobile Gov Case Studies. Create your Statement of Work on RFP-EZ by leveraging our Sample Contracting Language for Mobile SOW’s for product development (apps, mobile web), testing and code-sharing. Use the Mobile Product Testing Guidelines and Resources pulled from government and the private sector available in four areas: security/privacy, accessibility, functionality/UX and app performance. Speed up your acquisition of testing services with ready-made sample SOW language with mobile developer qualifications. Leverage a crowd-sourced pool of federal volunteers to test your mobile web app/site on a wide range of mobile devices with the Federal Crowdsource Mobile Testing Program. Create mobile-enabled websites with responsive design and full multimedia capabilities with Sites.USA.gov. Reuse mobile code (frameworks, modular code and whole apps) and leverage testing scripts collected from multiple private and public sector sources on our Mobile Code Sharing Catalog. Get your mobile products designed right, from the beginning, using the Mobile Gov User Experience Guidelines and Recommendations. Use the federal friendly Terms of Service agreements and get your app in the app stores. Register your mobile product (app or mobile web site) with the Federal Mobile Products Registry for placement on the Federal Mobile Apps Directory. PROMOTE! Use the Federal Mobile Product API and create widgets to highlight yours and other agencies’ mobile products. Let us know when your product launches and we will help get the word out using DigitalGov.gov! This is a beginning–we’ll continue to develop new tools to help you develop mobile products for the public. Contact us via email and tell us what you need.